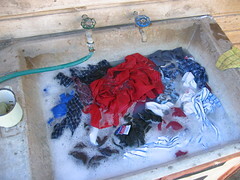 My clothes soak in the outdoor sink before the real laundry action gets started—with the washboard. This is the third in a series of snapshots of life in Pocuro. Unless you do it naked, laundry is one of those never-ending chores. Just when you think you’re done, more clothes go and get themselves dirty and need to be washed. In college, doing laundry was a mildly tedious task—hauling your clothes to the laundry room, waiting for machines, pumping them full of quarters, hoping there are driers available when your clothes are done, etc. If I only knew. Doing laundry in Pocuro is complicated by one additional factor: as my housemate Maureen explained, “You are the machine.” Laundry starts with lighting the water heater. As you fill the outdoor sink with hot water, you shake in some Omo powdered detergent—it’s like Tide, but in Spanish. Pre-treat those stains or there’s no hope. If your clothes are really dirty, a good soak is probably in order before you get down to business. Next, you arm yourself with an old school washboard that looks like it would be more at home in a Pottery Barn catalogue than next to your clothes. Scrub your clothes piece by piece, shirt by shirt, sock by sock, on the washboard. Remember: you are the machine. Squeeze out the soapy water and hope that it takes the dirt with it. That’s the way soap works, right? After you’re done scrubbing, toss the washed item in your fresh water rinse bucket. When you’ve accumulated a few pieces of clothing in the rinse bucket, soak and squeeze them to remove the rest of the detergent residue. At this point, you have moved a few articles from the wash cycle through the rinse cycle and now you have a decision to make: how am I going to dry these clothes? Option one is the classic: you just hang them on the clothesline and let the sun do the work. It’s good, especially when the Chilean summer sun is on your side. Option two is more take-matters-into-your-own-hands. Carry out the centrifugal spinner from the bathroom. Plug it in and put the empty peanut butter jar under the spinner’s exit spout. You’re going to be spinning the bejeezus out of these clothes and the water has to go somewhere. Loading the spinner is one-third skill, one-third luck, and one-third black magic. Until you learn the skill you may need to limit yourself to spinning one or two items at a time. If you try to run the spinner with an unbalanced load of clothing, it will shake and jump violently, as if possessed by an appliance-inclined demon. It’s worth it, though, because you can extract a quart or more of water from an allegedly wrung-out pair of jeans. That means you might be able to wear them pretty soon. Hang the spun clothes on the clothesline to complete the drying step. Continue the process, shifting from your role as human washer to spinner witch doctor, until everything is hanging on the clothesline. Wait until the clothes are dry to the touch. Take them down, fold them, and put them away. You’re done with laundry. Unless you were wearing clothes while you did it, in which case there’s still more to do.